Please note, the rocking horses on this page are not available for sale. The photos are for your interest & include examples of old vintage & antique rocking horses that are fortunate to have their original paintwork in tact. So many Antique rocking horses arrive having been over painted many times during their life by well meaning owners. Unfortunately this decreases their antique value. It can take many hours of sensitive restoration work to reveal their original paintwork once again. Examples shown below include rocking horses in original condition by manufacturers such as F H Ayres, G J Lines, Lines Brothers, J R Smith & Smith, Collinsons & Sons, Leach & other unattributed rocking horses that are just as special. Beautiful Florence is manufactured by F H Ayres and is a fine example of a large plain carved Ayres rocking horse with original paintwork. Her dapples are in tact, including much of her saddlery. She has a pretty face and is more feminine in character than the majority of Ayres horses on the market. Her mane looks to be a later replacement. This tiny Antique rocking horse attributed to F H Ayres has much of his original paintwork & gesso intact albeit worn in places. Unusually he has what looks like splodges in place of where dapples would usually be. This is a fine example of an Extra carved F H Ayres rocking horse with his original Gesso & paintwork intact. Extra carving means that the carver has carved more detail into the horse in areas such as the neck and legs to mimick muscle tone & tendons. He has had some light conservation work to preserve his original paintwork which has included a replacement mane & tail in keeping with his age. This little chap is a lovely example of the smallest of the Lines bow rockers! He has his Gesso and basecoat of blue paintwork intact and also his over dapples. His bows retain their original green paint. This beautiful rocking horse attributed to Leach shows a lot of his original paintwork intact. He looks to retain some of his original saddlery including his pommels & decorative metal badges. He has acquired some later additions, including saddlecloths stirrup leathers & irons and some later repairs to his tack. This sweet little vintage rocking horse is a Lines Brothers Sportiboy and he retains all his original gesso & paintwork (albeit well loved!) and it is nice to see his saddlery intact, minus his stirrup leathers & stirrups. The saddles that are removable often become separated from the horse. A fabulous example of an antique bow rocking horse in superb original condition. His paintwork is a wonderful deep yellow colour, quite unusual. He retains both of his original pommels. This is a large Lines Brothers rocking horse with original gesso, paintwork and bridle in tact. His Shellac has over time 'yellowed' his patina. His reins are later replacements. Note the remnant of his chest rosette. This beautiful head with the typical flared nostrils of the carving style of G J Lines. Note the extra carving to her neck mimicking muscle tone. Lovely also to see her original metal rosettes intact on her leather work. This tiny horse on bow rockers measures only a few inches high! Simply carved with original paintwork intact and what appears to be a mane & tail of sheeps wool. His bridle is painted on and his reins and saddle attached to him by tiny studs. 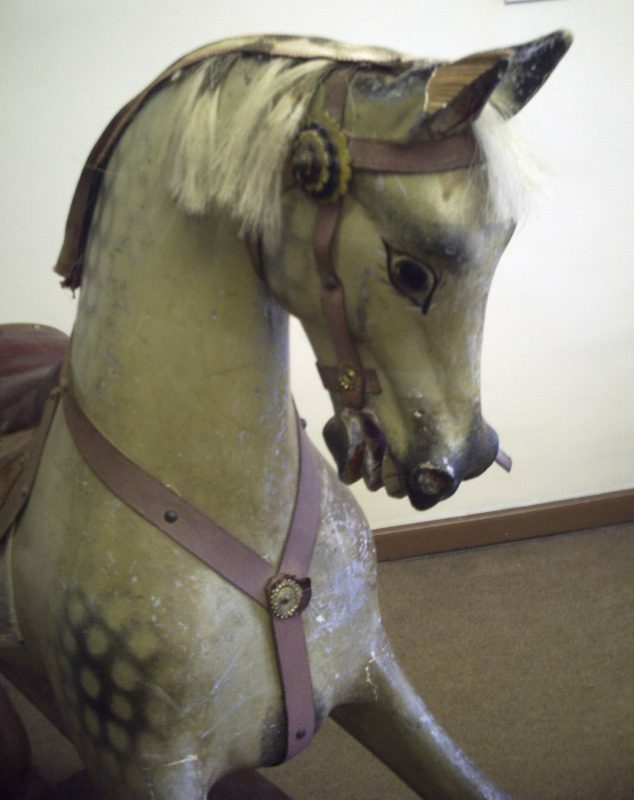 This rocking horse by Collinsons is in original condition with the all over heavy dappling typical of their style ( although this can vary depending on the worker at the time) The saddlery was fitted with many upholstery studs. The stands on the later Collinsons lacked the turned upright posts of the earlier horses. This head picture is of one of the earlier Stevenson Brothers rocking horses. In original condition with some lovely carving. Left in a wood finish. This tiny little rocking horse by David Postin is only a few inches high! David Postin crafted a variety of rocking horses in many different styles and the stands often have a distinctive line painted around them. This carving on this modern day rocking horse is simply stunning and incredibly realistic.